Perhaps it’s just me, but I see far too much hate towards Ensiferum in the online metal community. Claims relating to the ‘samey-ness’ of each album – accusations of stagnation. Regarding their previous output, 2015’s One Man Army, I really struggled to validate these naysayers – that was a fiery album that really made its mark with multiple anthemic punches. However, upon the release of the brand new opus Two Paths, I find myself slowly allowing the negativity to seep into my brain. Hints of stagnation abound, Ensiferum’s seventh LP shows the Finns approaching what might be considered ‘going through the motions’. Not that this is a ‘bad’ album, there are still a few gems and momentous occasions present, but this simply isn’t going to make the same impact. 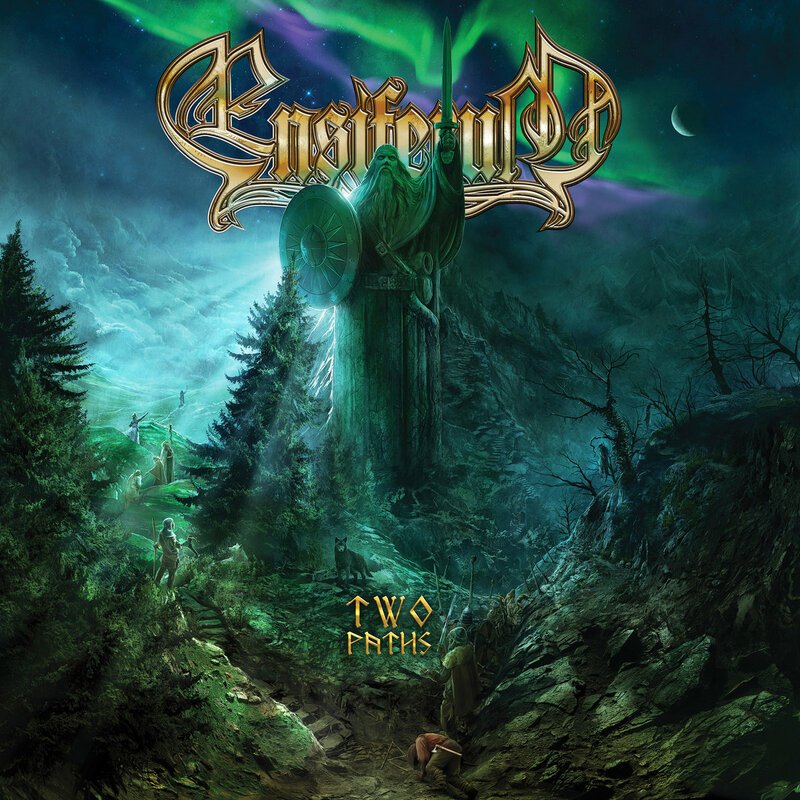 The production quality Ensiferum have pursued over the years has certainly given them a unique timbre, but Two Paths pushes that crisp, metallic clamour to an almost irritating point – especially with the overly-loud snare which just becomes intrusive. The guitars are nowhere near as beefy as before, and the symphonics are a little far back in the mix – which is a bigger disappointment considering how effective they can be. I remember when 2009’s “From Afar” blew me away with punchy orchestral accentuations, but now they’ve taken mainly a back seat save for a few moments of glory. The trumpets in “For Those About To Fight For Metal” are pretty darn epic, and the constant presence of strings throughout each linking section remind us that this is definitely a symphonic folk metal band. Speaking of that opening track – it fails to deliver the immediacy of previous openers from the Finns. The main melody is dull, the tempo never sits comfortably and the chorus lacks a sense of triumph despite the layered choral vocals. One can’t help but feel that third track “Way Of The Warrior”, despite having one of the most clichéd titles since “Battle Song”, would’ve made a more appropriate opening number. I especially love how the clean vocals take over the chorus at the end, revealing the melody behind Petri’s screams. Petri’s consistently gritty growls are once again en pointe, never faltering and eternally decipherable – I only wish he was further forward in the mix. However, on the subject of vocals, why the hell have the band opted for a semi-melodic punky singing at the most inappropriate points?! The chorus of the title-track could have benefitted so much from using female vocals – perhaps Netta Skog? After all, she sounds fabulous on “Feast With Valkyries”. But for some reason Markus Toivonen takes it upon himself to sing incredibly tunelessly – ruining both the title-track and the catchy “Don’t You Say”. So what does Two Paths get right? The folk melodies themselves are intact and infectious – especially effective when combined with Skog’s accordion. The obligatory intro “Ajattomasta Unesta” is a compelling way to kick things off, beautifully stating the theme from “For Those About To Fight For Metal” – as if the band knew I’m a sucker for recurring themes. The galloping “King Of Storms” is a stormer, particularly thanks to its irregular time changes here and there. But the greatest segment on the whole album comes in the shape of the 4:30 mark in “I Will Never Kneel” – Ensiferum haven’t sounded that big in years; a real ‘fist to the sky’ moment! In conclusion, my recommendation would be to stick the disc on in the background, perk up for tracks three, five, eight and ten, then let the rest fade into obscurity. Two Paths isn’t a bad album, and it still contains hints of that early Ensiferum magic, but I would warn the Finns to be gravely aware of the hazards of stagnation. This entry was posted in Bands, Folk Metal, Reviews and tagged accordion, Ensiferum, finland, Finnish folk metal, Finnish metal, folk, folk metal, Jari Maenpaa, Metal Blade Records, Netta Skog, Petri Lindoos, symphonic folk metal, Two Paths.